Is LEED Certified Development Dead? While it is clear that the intentions of the LEED initiative were focused on a commitment to environmental sustainability, the result of the program may have veered more towards a marketing or public relations strategy employed by some developers. However, when assessing ethical, moral, or fiduciary requirements to stakeholders, does the intent of an environmental initiative matter as long as the desired result is accomplished? Because the markets have expressed a commitment and revived devotion to environmental sustainability, many suppliers have complied with consumer demands and established environmental products or services to fulfill consumer demand. This dynamic nature of traditional supply and demand relationships has flexed even more so with the development of LEED-certified buildings across the country. As the importance of environmental sustainability become more prevalent throughout the general marketplace, users of real estate (i.e. ; everyone) started to demand a quantification of a building’s environmental impact. The LEED standard of environmental impact was established in 1998 by the USGBC, and within a short time, the marketplace became aware of this quantifiable measure of a building’s environmental impact. The question remains: “Are developers truly committed to environmental sustainability, or are they just complying with market demands?” The answer does not matter. The net result is the same regardless of the motivating force. Ultimately, developers, like all businesses, are focused on profitability. While there are obvious variations on the definition of profitability (i.e. : Unilever’s Triple Bottom Line approach), ultimately, a business will strive to add value for its stakeholders. This devotion to profit maximization includes adherence to market demands or a commitment to environmental sustainability, or preferably both. So, given all of the green roofing and other obvious efforts to conform to LEED standards, these development attributes must serve as some net benefit to environmental concerns, right? 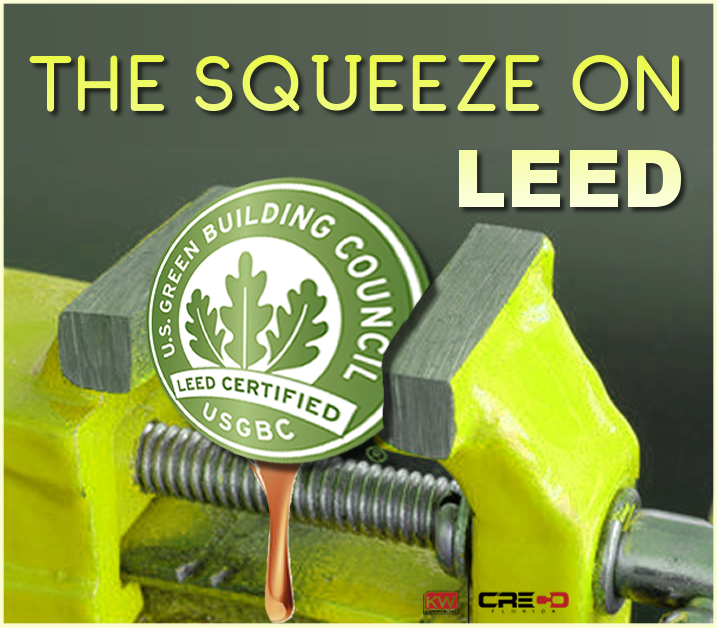 If the LEED program was an unreliable certified measurement, the marketplace would evolve to discredit any certification issued by LEED and over time, it would become defunct. Therefore, it must be assumed that any level of LEED certification serves as a quantifiable measurement of a building’s environmental impact. However, the installation of energy efficient building systems becomes an entirely different scenario if installers or developers tamper with, exaggerate, or misrepresent the submission for LEED certification. Any evidence of misrepresentations by green developers sheds light on the theory that developers do not drive the green evolution of construction. Rather, builders are only complying with demand. If the environment were the priority, LEED-related fraud would not be on the rise. It is up to the free markets to determine whether the LEED certification is a reliable unit of measure for environmental sustainability and the end-users, purchasers, or patrons of the LEED certified buildings will have the last word on this matter. If consumers are demanding an energy conservation initiative, then the release of accurate data will establish transparency among the marketplace. However, if the building is simply marketed as LEED Gold Certified, then it is not the responsibility of the ownership entity to formally disclose the detailed water conservation figures. The market will determine whether the LEED standard is a valuable indicator of environmental sustainability.